The Royal Library of Alexandria, part of a museum and library modeled after the Lyceum in Athens, was the largest library in ancient world. Originally founded in 283 B.C.E. as a temple of the Muses, the Musaeum (whence we get "Museum") included lecture areas, gardens, a zoo, and religious shrines. Resident scholars numbering up to 100 conducted research as well translated and copied documents, particularly works of classical Greek philosophy, poetry, and drama. The library is estimated to have stored some 400,000 to 700,000 parchment scrolls from Assyria, Greece, Persia, Egypt, India, and many other nations. The city of Alexandria was founded by Alexander the Great in 332 B.C.E. and grew to become the largest city of the ancient world within a century of its founding. Alexandria was a center of Hellenistic culture and home to the largest Jewish community in the world (the Greek Septuagint, a translation of the Hebrew Bible, was produced there). While the library's destruction remains a mystery and represents one of the great losses of humanity's store of knowledge, the concept of a library as a resource for learning and scholarship inspired the preservation of knowledge in libraries and museums ever since. The idea that learning should serve all humanity, not only a privileged elite, can be traced to this ancient institution. Such an initiative was an outgrowth of the Hellenistic values that owed much to the conquests and policies of Alexander the Great. Within the Mediterranean world and extending as far as the Indus Valley, Hellenistic thought fostered greater awareness of common human origins and attributes. The library's establishment can be seen as a direct result of Alexander's own policy of spreading Greek culture, but also adopting what he considered to be valuable from other cultures. The sharing of knowledge, including philosophical and ethical discourse, strengthened this recognition of collective human identity and shared values. Alexander even crossed racial barriers by encouraging inter-marriage and the borrowing and mixing of cultural forms. 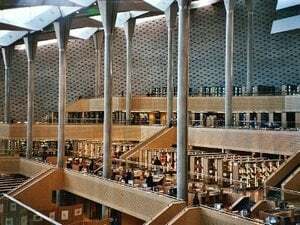 A new library, the Bibliotheca Alexandrina was inaugurated in 2003, near the site of the old library. Interior of the new Library, opened in 2003. According to one story, the Library was seeded with Aristotle's own private collection, through one of his students, Demetrius Phalereus. Another account explains how the library's collection grew so large. By decree of Ptolemy III of Egypt, all visitors to the city were required to surrender all books and scrolls in their possession; these writings were then swiftly copied by official scribes. The originals were put into the Library, and the copies were delivered to the previous owners. While encroaching on the rights of the traveler or merchant, it also helped to create a reservoir of books in the relatively new city. In 2004 a Polish-Egyptian team claimed to have discovered part of the library while excavating in the Bruchion region. The archaeologists claimed to have found thirteen "lecture halls," each with a central podium. Zahi Hawass, president of Egypt's Supreme Council of Antiquities said that all together, the rooms uncovered so far could have seated five thousand students. Many modern libraries follow the design of this ancient bibliotheque, with a central reading area surrounded by books (in this instance, scrolls), either directly accessible to the readers or accessed with the assistance of staff. The role of librarians as knowledge gatekeepers and guides can be said to date from Alexandria's Library. The library was really one of the earliest universities, as scholars gathered to study there and would have lodged nearby. To commemorate the ancient library, the government of Egypt has built a major library and museum complex at Alexandria, called the Bibliotheca Alexandrina (website). Few events in ancient history are as controversial as the destruction of the library, as the historical record is both contradictory and incomplete. All that is left of many of the volumes are tantalizing titles that hint at all the history lost from the building's destruction. Not surprisingly, the Great Library became a symbol for knowledge itself, and its destruction was attributed to those who were portrayed as ignorant barbarians, often for purely political reasons. Much of the debate rests on a different understanding of what constituted the actual library. Large parts of the library were likely decentralized, so it is appropriate also to speak of the "Alexandrian libraries." Both the Serapeum, a temple and daughter library, and the Museum itself existed until about 400 C.E. Only if one believes the Museum to be distinct from the Great Library, an event of destruction prior to that point becomes plausible. Seneca the Younger (49 C.E. ), the first writer to mention it (and that nearly 100 years after the alleged event), definitely says that 40,000 books were burned. Plutarch (46-120 C.E.) says that the fire destroyed the great Library. Aulus Gellius (123-169 C.E.) says that during the "sack" of Alexandria 700,000 volumes were all burned. Dio Cassius (155-235 C.E.) says that storehouses containing grain and books were burned, and that these books were of great number and excellence. Ammianus Marcellinus (390 C.E.) says that in the "sack" of the city 70,000 volumes were burned. Orosius (c. 415 C.E. ), the last writer, singularly confirms Seneca as to number and the thing destroyed: 40,000 books. Of all the sources, Plutarch is the only one to refer explicitly to the destruction of the Library. Plutarch was also the first writer to refer to Caesar by name. Ammianus Marcellinus' account seems to be directly based on Aulus Gellius because the wording is almost the same. The majority of ancient historians, even those strongly opposed to Caesar politically, give no account of the alleged massive disaster. Cecile Orru argued in Antike Bibliotheken (2002, edited by Wolfgang Höpfner) that Caesar could not have destroyed the library because it was located in the royal quarter of the city, where Caesar's troops were fortified after the fire (which would not have been possible if the fire had spread to that location). Furthermore, the library was a very large stone building and the scrolls were stored away in armaria (and some of them put in capsules), so it is hard to see how a fire in the harbor could have affected a significant part of its contents. Lastly, modern archaeological finds have confirmed an extensive ancient water supply network which covered the major parts of the city, including, of course, the royal quarter. The destruction of the library is attributed by some historians to a period of civil war in the late third century C.E.—but we know that the Museum, which was adjacent to the library, survived until the fourth century. There are also allegations dating to medieval times that claim that Caliph Umar, during an invasion in the seventh century, ordered the library to be destroyed, but these claims are generally regarded as a Christian attack on Muslims, and include many indications of fabrication, such as the claim that the contents of the library took six months to burn in Alexandria's public baths. According to this account Caliph Umar is reported to have said that if the books of the library did not contain the teachings of the Qur'an, they were useless and should be destroyed; if the books did contain the teachings of the Qur'an, they were superfluous and should be destroyed. Phillip K. Hitti (1970: 166) states that the story "is one of those tales that make good fiction but bad history." He goes on, "the great Ptolemic library was burnt as early as 48 B.C.E. by Julius Ceasar. A later one, referred to as the daughter library, was destroyed about 389 C.E. as a result of an edict by the Emperor Theodosius. At the time of the Arab conquest, therefore, no library of importance existed in Alexandria and no contemporary writer ever brought the charge about Amr or Umar." Historian Bernard Lewis (2001: 54) has thus summarized the verdict of modern scholarship on the subject: "Modern research has shown the story to be completely unfounded. None of the early chronicles, not even the Christian ones, make any reference to this tale, which is mentioned in the thirteenth century, and in any case the great library of Serapenum had already been destroyed in internal dissensions before the coming of the Arabs." As noted above, it is generally accepted that the Museum of Alexandria existed until c. 400 C.E., and if the Museum and the library are considered to be largely identical or attached to one another, earlier accounts of destruction could only concern a small number of books stored elsewhere. This is consistent with the number given by Seneca, much smaller than the overall volume of books in the library. So under this interpretation it is plausible that, for example, books stored in a warehouse near the harbor were accidentally destroyed by Caesar, and that larger numbers cited in some works have to be considered unreliable—misinterpretations by the medieval monks who preserved these works through the Middle Ages, or deliberate forgeries. 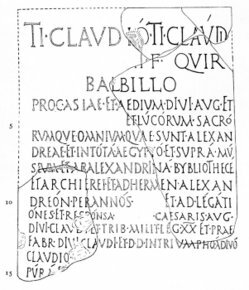 Inscription referring to the Alexandrian library, dated 56 C.E. Even if one considers the museum and the library to be very much separate, there is considerable evidence that the library continued to exist after the alleged destruction. Plutarch, who claimed the Great Library was destroyed (150 years after the alleged incident), in Life of Antony describes the later transfer of the second largest library to Alexandria by Mark Antony as a gift to Cleopatra. He quotes Calvisius as claiming "that [Mark Antony] had given her the library of Pergamus, containing two hundred thousand distinct volumes," although he himself finds Calvisius' claims hard to believe. In Einführung in die Überlieferungsgeschichte (1994: 39), Egert Pöhlmann cites further expansions of the Alexandrian libraries by Caesar Augustus (in the year 12 C.E.) and Claudius (41-54 C.E.). Even if the most extreme allegations against Caesar were true, this raises the question of what happened to these volumes. Athenaeus (c. 200 C.E.) wrote in detail in the Deipnosophistai about the wealth of Ptolemy II (309-246 B.C.E.) and the type and number of his ships. When it came to the library and museum, he wrote: "Why should I now have to point to the books, the establishment of libraries and the collection in the Museum, when this is in every man's memory?" Given the context of his statement, and the fact that the museum still existed at the time, it is clear that Athenaeus cannot have referred to any event of destruction—he considered both facilities to be so famous that it was not necessary for him to describe them in detail. We must therefore conclude that at least some of the Alexandrian libraries were still in operation at the time. At the solicitation of Theophilus bishop of Alexandria the emperor issued an order at this time for the demolition of the heathen temples in that city; commanding also that it should be put in execution under the direction of Theophilus. Seizing this opportunity, Theophilus exerted himself to the utmost to expose the pagan mysteries to contempt. And to begin with, he caused the Mithreum to be cleaned out, and exhibited to public view the tokens of its bloody mysteries. Then he destroyed the Serapeum, and the bloody rites of the Mithreum he publicly caricatured; the Serapeum also he showed full of extravagant superstitions, and he had the phalli of Priapus carried through the midst of the forum. "The Mouseion, being at the same time a 'shrine of the Muses', enjoyed a degree of sanctity as long as other pagan temples remained unmolested. 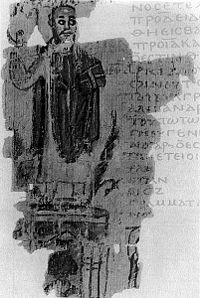 Synesius of Cyrene, who studied under Hypatia of Alexandria at the end of the fourth century, saw the Mouseion and described the images of the philosophers in it. We have no later reference to its existence in the fifth century. As Theon, the distinguished mathematician and father of Hypatia, herself a renowned scholar, was the last recorded scholar-member (c. 380 C.E. ), it is likely that the Mouseion did not long survive the promulgation of Theodosius' decree in 391 to destroy all pagan temples in the City." There is a growing consensus among historians that the Library of Alexandria likely suffered from several destructive events, but that the destruction of Alexandria's pagan temples in the late fourth century C.E. was probably the most severe and final one. The evidence for that destruction is the most definitive and secure. Caesar's invasion may well have led to the loss of some 40,000-70,000 scrolls in a warehouse adjacent to the port (as Luciano Canfora argues, they were likely copies produced by the Library intended for export), but it is unlikely to have affected the library or museum, given that there is ample evidence that both existed later. Civil wars, decreasing investments in maintenance and acquisition of new scrolls, and generally declining interest in non-religious pursuits likely contributed to a reduction in the body of material available in the library, especially in the fourth century. The Serapeum was certainly destroyed by Theophilus in 391 C.E., and the museum and library may have fallen victim to the same campaign. If indeed a Christian mob was responsible for the destruction of the library, the question remains why Plutarch casually referred to the destruction of "the great library" by Caesar in his Life of Caesar. Plutarch was patronized by influential Romans, including important Senators, to whom some of Plutarch's writings were dedicated. Such patrons would likely have appreciated laying the blame on the relatively populist Julius Caesar. It is also important to note that most surviving ancient works, including Plutarch, were copied throughout the Middle Ages by Christian monks. During this copying process, errors have sometimes been made, and some have argued that deliberate forgery is not out of the question, especially for politically sensitive issues. Other explanations are certainly possible, and the fate of the library will continue to be the subject of a much-heated historical debate. The libraries of Ugarit, c. 1200 B.C.E., include diplomatic archives, literary works and the earliest privately-owned libraries yet recovered. 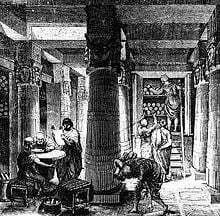 The library of King Ashurbanipal, in Nineveh - Considered to be "the first systematically collected library," it was rediscovered in the nineteenth century. While the library had been destroyed, many fragments of the ancient cuneiform tables survived, and have been reconstructed. Large portions of Epic of Gilgamesh were among the many finds. The Villa of the Papyri, in Herculaneum, was one of the largest private libraries of the early Roman Empire. Thought to have been destroyed in the eruption of Mount Vesuvius, it was rediscovered in 1752. The contents of the library were found to have been carbonized. Using modern techniques, the scrolls are currently being meticulously unrolled, and the writing deciphered. At Pergamum the Attalid kings formed the second-best Hellenistic library after Alexandria, founded in emulation of the Ptolemies. When the Ptolemies stopped exporting papyrus, partly because of competitors and partly because of shortages, the Pergamenes invented a new substance to use in codices, called pergamum or parchment after the city. This was made of fine calfskin, a predecessor of vellum and paper. This is an early example of how a development was stimulated by pragmatic need to substitute a new technology for one that could no longer be obtained. Jochum, Uwe. 1999. "The Alexandrian Library and its aftermath" from Library History vol. 15: 5-12. Orosius, Paulus. 1964. The Seven Books of History Against the Pagans, Translated by Roy J. Deferrari. Washington, DC: The Catholic University of America. Parsons, Edward Alexander. 1952. The Alexandrian Library. London: Cleaver-Hume Press. Relevant online excerpt. Stille, Alexander. 2002. “The Return of the Vanished Library.” 246-273 in The Future of the Past. New York: Farrar, Straus and Giroux. End of Classic Scholarship in Egypt - Researcher of Christian origins and biblical history Kenneth Humphreys analyzes the destruction of the library and, along with the renowned scholar of the Roman Empire Edward Gibbon, concludes that it was the Christians' fault, specifically Bishop Theophilus. This page was last modified on 10 March 2016, at 22:05.